Crowds gathered in somber reflection near the Rwandan capital of Kigali on Tuesday, marking the 15th anniversary of the start of a 100-day genocidal massacre in Rwanda in which an estimated 800,000 people were brutally killed. Rwandan President Paul Kagame addressed thousands during an emotional candle-lighting ceremony, criticizing the international community for not doing more to prevent the bloody wave of violence. “I remind those experts that they need to go back to school,” Kagame told reporters. “These children you saw here — you think they are standing there because they are exploiting everybody’s guilt Sparked by the assassination of then-Rwandan President Juvenal Habyarimana, extremist militias made up of ethnic Hutus slaughtered ethnic Tutsis and moderate Hutus across Rwanda after Belgian peacekeepers left the country. During a ceremony at the United Nations, U.N. Secretary General Ban Ki-moon reflected on what he described as a “horrifying scene and experience.” “Today is a day to open our eyes to this suffering and honor the memory of those killed in Rwanda 15 years ago,” he said. “But beyond reminding us of the horror, that silence should spur us to action.” In a White House statement, U.S. President Barack Obama called for a period of reflection. “As we mourn their senseless passing, we must also acknowledge the courageous men and women who survived the genocide and have since demonstrated remarkable strength and generosity in forgiving those who committed these heinous acts,” Obama said. Among them was a former Kigali hotel owner named Paul Rusesabagina. Fifteen years ago, he sheltered 1,200 Tutsis and moderate Hutus as machete-wielding gangs cut down hundreds of thousands outside his hotel walls. “I did all I could during that time,” Rusesabagina told CNN in a 2006 interview. “We knew there were intentions between Hutus and Tutsis,” he said. “But we never believed that people can be so cruel — can be so wild.” Rusesabagina’s efforts were later highlighted in the 2004 Hollywood film “Hotel Rwanda,” starring Don Cheadle, who was nominated for an Academy Award for his portrayal of Rusesabagina, and Nic Nolte. 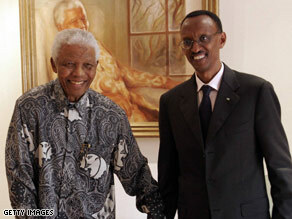 The genocide ended when Tutsi-led militias backing Kagame ousted the Hutu government supporting the massacre. Candlelight vigils across Rwanda are expected throughout the week in commemoration.